By supporting St.George Foundation you too can help create brighter futures for children experiencing disadvantage. St.George Foundation holds two key fundraising events each year to raise much needed funds for the organisations we support. Contact the team about opportunities to volunteer at St.George Foundation events. Hear from one of Australia’s leading women in business. In previous years this event has attracted keynote speakers such as the Hon Julie Bishop MP, Gail Kelly, Lucy Turnbull AO and Ita Buttrose AO OBE. Into its 21st year, this black-tie event is complete with quality entertainment and lively fundraising activities. 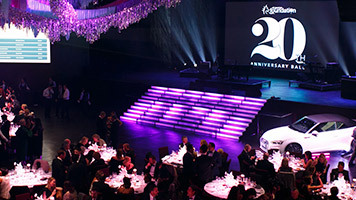 The St.George Foundation Ball is truly a night of magic, sparkle and glamour. Your donation, no matter how big or small, will make a difference to the Australian children’s charities that St.George Foundation supports. Find out more about the options to show your support. Your donation to St.George Foundation goes a long way to help small community organisations provide a brighter future for children in Australia who are experiencing disadvantage. To donate, simply follow the instructions on our Online Donation page. All donations over $2 are tax deductible. Payroll Giving is an easy way for you to donate regularly to St.George Foundation. Choose how much (or little) you would like to donate, and it will be deducted from your pre-tax salary each pay period. To register, please visit Good2Give, follow the prompts and select St.George Foundation as your nominated charity. All donations over $2 are tax deductible. 100% of your donation goes directly towards improving the lives of children in Australia as St.George Bank covers all of St.George Foundation's administration costs. 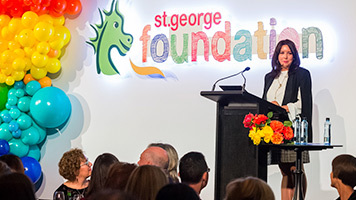 Please direct all donation enquiries to stgeorgefoundation@stgeorge.com.au.